Sag Harbor is the Hampton’s biggest destination for boating in the summer. Although the Harbor can get a bit busy, it provides the perfect jumping off point for wakeboarding in the Hamptons. There are plenty of marinas to launch your boat, buy fuel and pick up friends. From there you can find quieter coves near Cedar point, Smiths Cove on Shelter Island and Northwest Harbor. These coves are all perfect at blocking the wind and provide beautiful scenery as well! Our favorite place to wakeboard in the Hamptons is at Sunset Beach on Shelter Island. Located just across from the Village of Greenport on the North Fork, Sunset Beach is one of the Hampton’s busiest destinations on summer weekends. Fortunately, during the week, the crowds head back to the city and there is almost always flat water right in front of the beach. The views of Shelter Island heights and the North Ferry provide the perfect setting for a summer wakeboarding experience. 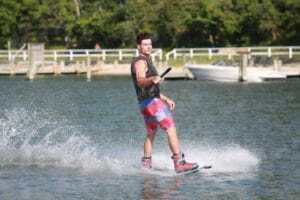 Three Mile Harbor in East Hampton is a perfect place for wakeboarding in the summer time. Inside the harbor, there is a designated water sports area on the North West side of the Harbor. On sunny summer days, you can venture out of the harbor and wakeboard in Gardiners bay with beautiful views of the North Fork, Connecticut and Rhode Island. There are several marinas inside the harbor that can provide launch ramps and fuel as needed. Although Montauk is known as a surf town, for most of the summer the surf is usually flat. That makes it the perfect time to try a different water sport to keep busy. Lake Montauk provides perfect Sheltered Water for Wakeboarding, Watersking and Wakesurfing. It is also a world class fishing destination, so if you are too tired to keep riding, you can relax and catch some fish!